If the reformation/rehabilitation of a probationer/parolee seems to be hindered by illness, injury, or a lack of a proper abode or employment, etc., a probation office can provide advice and make coordination so that they will receive the necessary support from welfare institutions, etc. If they cannot receive that support promptly enough or the support provided by such institutions is not deemed sufficient, the probation office concerned will then provide the probationers/parolees with urgent aid (urgent aid, etc. ), including the provision of food, clothing, and travel expenses, or entrust them to a halfway house. Urgent aftercare of discharged offenders provides those released on completion of their term of imprisonment, granted suspension of execution of the sentence without probation, granted suspension of prosecution, sentenced to fine or petty fine, released or provisionally released from a workhouse, or released or released on parole from a juvenile training school and who have completed their term of parole supervision, etc. with urgent aftercare which provides what urgent aid does, upon request. It covers a period of no longer than six months after being discharged from the physical restraints imposed within criminal proceedings or protective measures. It can also cover an additional period of no longer than six months if deemed particularly necessary for the rehabilitation of the offender concerned. 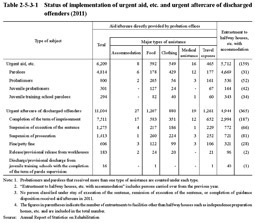 Table 2-5-3-1 shows the status of implementation of urgent aid, etc. 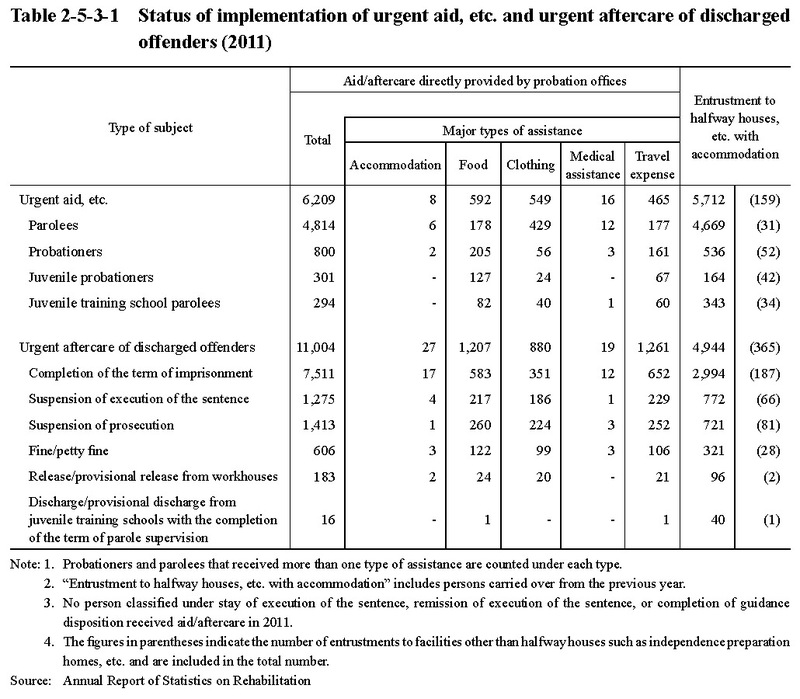 and urgent aftercare of discharged offenders by type of subject in 2011.